JOINT STAND AT THE SABA SABA TRADE FAIR IN TANZANIA - africrops! africrops! was represented at this year’s Saba Saba trade fair together with the certification authority Kiwa BCS at the German joint stand. The stand was supported by the Federal Ministry of Economics. With almost 2,500 exhibitors and around 500,000 visitors, Saba Saba is Tanzania’s largest international trade fair. It took place for the 42nd time in Dar-es-Salam from 28 June to 8 July 2018. The agricultural sector in Tanzania and East Africa in general is growing steadily. In addition to the local market, many producers are seeking opportunities to export high-quality agricultural products to Europe. Organic certification according to European standards serves as a door-opener to access these new markets. In addition, the higher selling prices for organic produce benefits local farmers. As a company that offers advice to local farmers and at the same time imports organically grown plant products, africrops! considers cooperation with a reputable certification body as very important. 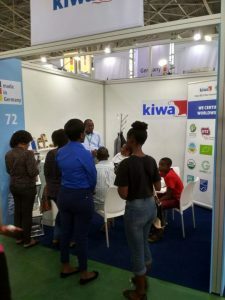 The joint appearance with Kiwa BCS served the primary goal to illustrate the organic certification process to visitors using the example of moringa and baobab. At the same time, the special business approach of africrops! and the work in Tanzania was presented. 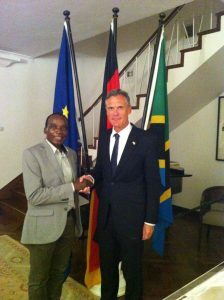 The German Ambassador to Tanzania, Dr. Detlef Wächter, was also very interested in the africrops! approach and the cooperation with Kiwa BCS. The presence of German companies in Tanzania is highly appreciated by representatives of the Tanzanian politicians and the business community. The “German Pavilion” was named the best foreign stand at the Saba Saba trade fair by the Tanzanian Prime Minister.